I've pinned a hundred or more projects on Pinterest that I'm interested in trying with my students. However, before they reach my students....I need to try them out & see if it is something that will actually work in my classroom. I'm still thinking through this one. I like the results, but am trying it imagine how it would work with a class of 20some students. If you've not seen this project...you place a layer of shaving cream in a pan. Then you drop acrylic paint(I'm sure liquid tempera would work too...powdered tempera does not work well...I tried it) into the shaving cream and take a stick of some sorts(I used a paint brush handle) and draw lines in the shaving cream...dragging the paint as you go. Then place a piece of paper into the pan, pressing gently to make sure the paper is covered. Remove paper and let stand for several minutes. Then take a squeegie and remove the mixture(I used a plastic bowl). I've also planned on trying this out. I've thought about doing it directly on the tables, rather than in a tray, since shaving cream can be a good cleaner. I think I saw posted somewhere a VanGogh project done with swirling skies done with this process. I've got to get some shaving cream to give it a try! 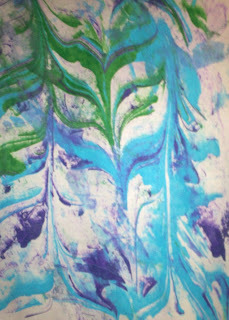 Another idea would be to make paper this way to use for greeting cards perhaps? Or maybe an undersea image with marbled waves? I'll be interested to see what you come up with. You are right! Pinterest has got a lot of interesting projects but it is better to try it first in order to se if they can work at school or not. I like this one an I will try it with my class ( 5 years old). I think I will make round papers to decorate the class ( mobiles or similar) or other shapes to put in a greeting card. Phyl, I love the idea of an underwater picture!!!!!!!! This would be perfect!!! If you used the trays you could do the prep right before hand, though I ma not sure how long the shaving cream will stay quite right. I love the table idea....wish my kitchen table was a class room table!! Guess I'll need to borrow the one my parents have....I also wonder about doing this on fabric. I have done it when I was doing more stamping stuff. Amanda just did this with one of her classes this summer, consult her too. I really love the VanGogh idea! I have done this project with a small group (and by small I mean 6) of kids. The results were great. The kids loved the project! But it was very messy and after only a couple prints, the shaving cream had to be replaced to make a new clean marble print.If you can manage to pull this off with a large group, my hat is off to you. :) By the way, we used our prints as journal covers for some note books I bought at Michael"s for a buck.Also, Patty from Deep Space Sparkle tried this project. Check out her post. 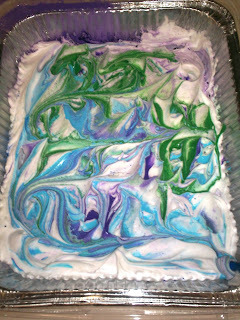 I second the food coloring OR liquid watercolors. The dye absorbs immediately so you don't need to let it stand for any period of time---wipe immediately! But definitely try it out yourself. I just assisted with a project during a methods class in university. I can't even remember what they used the paper for, or how it was doing it with a room full of kids, but just remember the technique. Now that I think about it, I did repeat the technique with kids at a summer camp. We turned our marbleized paper into planets during Outer Space week. New to your site and just had to comment!! I have done this with my students but also with girl scouts. I put the shaving cream right on the table and instead of paint I use dried up markers. Just take the middle out of the markers and put them in a bottle of some sorts and add water, makes a great dye for the marbling. Then just add a few drops of the liquid to the shaving cream and either use a popsicle stick or something else to swirl the dye around. Good Luck and love you site!!! I have done this project using slightly watered-down tempera paint in little spray bottles. I had second graders spray yellow, orange, red and brown on top, no swirling necessary. We pulled a print and immediately cleaned off the extra cream and plopped it right back into the pan. We used ours on manilla paper and drew fall leaves and out lined with sharpie. I just rotated the kids through a couple at a time while the other kids practiced leaves or drew something else "fallish". Worked great plan to do it again! I've done with lesson quite a few times to make papers for book making. If you are doing it with lower than 4th grade have them come up to a separate table in smaller groups while everyone else works on something else. For the older kids I've done it with 28 kids at a time. Food coloring is best...but stains...liquid watercolor is a close second. Have some spatulas around for spreading the shaving cream and use matt/chip board scraps to scrape off the shaving cream. 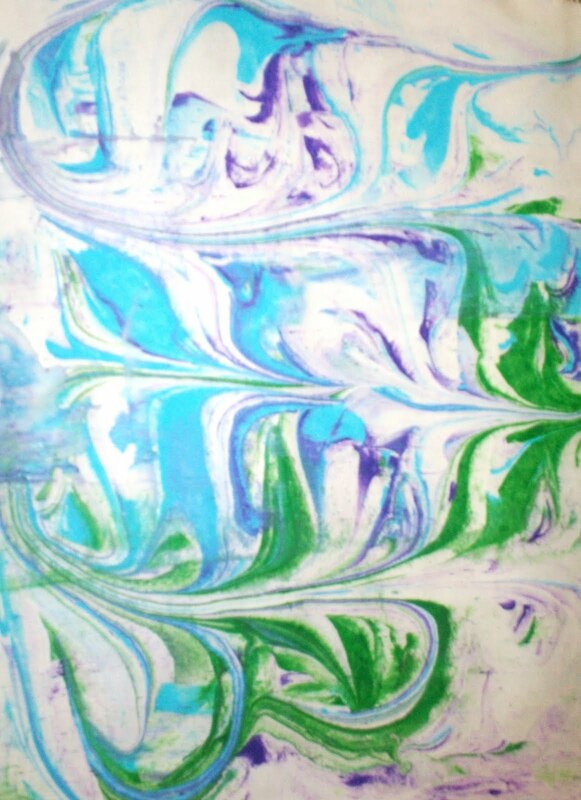 My students are doing bookbinding and expressed interest in paper marbling - this would be an easy way for them to do it! I've done this project with 6th grade (it can really work with any) but we used food coloring (from the dollar store) and shaving cream. Because marbleizing originated in Asia, we used the paper to make origami houses and set them in a Japanese landscape. The kids loved it and learned geography, origami and had fun making a big mess! Just pre-cut the paper into perfect squares and they'll be ready to go! I do this with my High School Fine Arts Survey class and we do it right on the table and I use water colors. My students then use the marbled paper to make their columns for their greek/roman page in their altered book. This project is always a hit with High Schoolers!!! I've done this before and used cafeteria trays, small spray bottles filled with diluted liquid watercolors. If you do it with elementary students be prepared to spend a lot of time talking about what you DON'T do when your hands are covered in shaving cream. We used the paper for covers for student sketchbooks and note cards for the local hospital. I do this with my students and I teach them about Turkish "Ebru" marbelizing, as it is a very similar process....I find that watercolor paint works best, rather than acrylic and I use small rectangles of cardboard to scrape off the shaving cream. You can use the papers to make art journals, cards etc. Or sometimes i just frame them as is! I have done this before with shaving cream and liquid watercolor. Worked great. They really didn't need any dry time so the next station did fish printing on top of the paper. I have done the printing with pretend fish and real. The time we did it with real fish the shaving cream smell really helped to offset the smell of the fish.This project is much fun and the results are great. I've done this as a starry night project. Tape plastic bag down. Mark in sharpie on plastic the size of your paper. Shaving cream sprayed horizontal & vertical. Take something flat to smooth out your surface. LIQUID WATERCOLORS are the key for the color. We focused on either warm or cool colors. Sprinkle evenly on top, not too much. Hair pick combs lightly through the cream-vertical, horizontal then in swirls. paper on top, GENTLY rub then pull the print. Scrape off the excess. Mr E, What's your pinterest account link? FISKARS... WHAT HAPPENED TO YOU!?!?!?! A New Blogger to Check Out!!! !